Somewhat surprisingly, I made quite a lot of progress this week on my little Alfresco proof of concept project. Or maybe its not that surprising. I guess once you understand what you can do with these three Alfresco features - Spaces, Rules and Actions - lot of things fall just into place on their own. So anyway, this post describes my implementation of a simple (ie, content oriented) workflow using these features. A high-level description of the workflow can be found here. 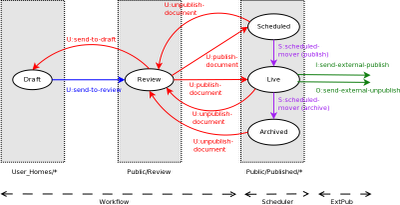 The state diagram for the workflow, this time annotated with the actions that are fired on each transition, is shown above. For convenience, I have grouped the actions into three broad categories, corresponding roughly with the Drupal module that we've used to achieve similar functionality. But first, a little digression. In order to take advantage of the recursive nature of rules (ie, a rule can be made to apply to current space and all its subspaces), I changed the folder structure a bit, as shown below. I also changed the content model to make my:publishable an aspect rather than have all my publishable content types (only my:post at the moment) inherit from my:publishableDoc type. This was not strictly necessary, but I wanted to add some content types in the future which don't follow the my:publishableDoc template. I have updated the relevant files in my post describing the content model. To paraphrase the Drupal Workflow Page, this module allows the creation and assignment of an arbitary set of workflow states to a node type. Transitions between workflow states can have actions assigned to them. 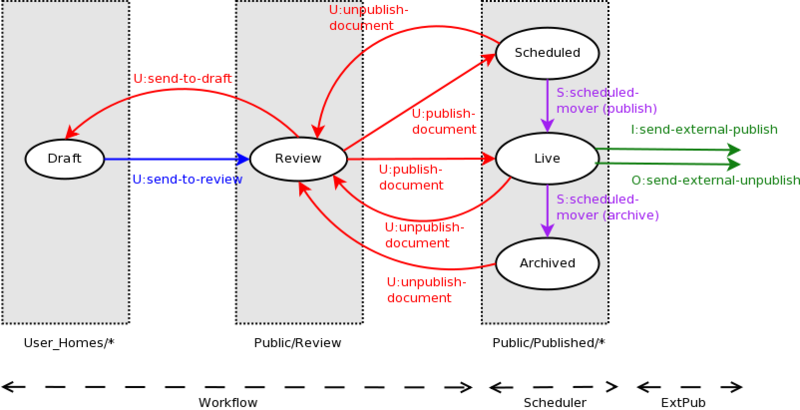 My workflow implementation is similar - in my system, there are 3 workflow states - Draft, Review and Published - that are baked into the custom my:publishable aspect. Node types that participate in this workflow will have the my:publishable aspect applied to their definition. As you can see, we can figure out the source state from the space in which the node currently resides. The target state is the current value of my:pubState. In our hypothetical fairy tale corporation, there is a single editor, so in all workflow transitions that end in Review, "doc" is our target owner - if there were multiple editors, one possibility could be to "assign" a default editor to a blogger on creation. Other editors could still review a post if needed, since they share the same permission group (GROUP_BLOGGER). The objective of setting up the decision table above is to make my actions trigger automatically on update of the node (ie, without requiring the user to "Run this Action"). One "feature" of Alfresco actions is that to be runnable via an Action Executer, they need to have a NAME field defined, which must correspond to the bean id in the Spring context. So we have to define four actions to handle the four transitions described above. For ease of maintenance, I have put this logic into a WorkflowHelper class, and the four actions just call the assign() method on this helper class. So the action classes ended up looking very similar to one another. The table below shows the list of "workflow" actions. send-to-draft Public/Review No UPDATE Invoked by Editor to change owner back to creator and move node back to user's home directory. publish-document Public/Review No UPDATE Invoked by Editor to move node to appropriate subdirectory of Published based on value of my:pubDttm and my:unpubDttm. unpublish-document Public/Published Yes UPDATE Invoked by Editor to move node from any subdirectory of Published back to Review. The action executor classes basically delegate to the workflow helper, so I just show you the code for these classes without any explanation. * Change workflow state from Draft to Review. * Configured on: user_homes and subspaces. * Change workflow state from Review to Draft. * Change workflow state from Review to Published. * Change workflow state from Published to Review. The workflow helper is where most of the work happens. As mentioned earlier, it is possible for us to "know" what to do based on the current location and the state of the node, so thats what we do here. The init() method maps "interesting" folder nmes (specified in Spring configuration) to the corresponding NodeRef - this makes the configuration a bit easier to read. The assign() method is used by the actions described above. We also have a move() method that is used by my scheduler "module" described below - this is mostly a convenience and an attempt to reuse the folder name to NodeRef mapping extracted in the init() method. * in our hypothetical system. I also have a custom exception class defined below. I thought this would be useful, but it turns out that it doesn't make a difference. I include it here for completeness, it would have been perfectly acceptable to throw a java.lang.Exception instead. * Exception thrown if the transition is not valid. I decided to put all my action configuration in a single extension *-context.xml file. I show here the relevant snippet. If you want to try out the code yourself, stick the snippets from the three "modules" together. And here is the relevant section of the mycompany-actions.properties file. This just specifies the name and description assigned to the action NAME key. The Drupal Scheduler Module allows nodes to be published and unpublished on specific dates. I achieve this using two date fields (specifying the scheduled publish and unpublish dates) in the my:publishable aspect. We have used these fields in our workflow actions to determine whether to move a node from Review to Live or to Scheduled. I initially wrote a parameterized custom action that is passed in a target folder, and tried wiring it up with prebuilt Alfresco components as described in the Alfresco Scheduled Actions Wiki Page, but could not make it work. Not sure what I did wrong (I did set up the reference to templateActionDefinition in case you were wondering), but it just wouldn't move the node at the scheduled time. So I peeked at how the Alfresco built-in scheduled actions were wired up (in scheduled-jobs-context.xml) and discovered that they use a much more direct mechanism similar to that described in the Spring-Quartz Integration Page. There are slight differences - the Alfresco setup wires the scheduler into the Trigger and not the JobDetail using the Alfresco CronTriggerBean. In any case, this meant that I would need to write my own QuartzBean subclass to do the search to find the nodes that needed moving, and call my custom action with the target folder value. The flow is like this. There is a Scheduled Publish Job (a subclass of QuartzBean) that is responsible for finding the nodes to apply the custom action on. This is wrapped by the Spring JobDetailBean. The JobDetailBean is called by a Trigger at appropriate times set in the cron expression. When called, the JobDetailBean calls the Job to find the nodes that need to be moved, then for each node found, uses Alfresco's Action Service to invoke the the custom action on it. Although the action name is scheduled-publish, it is parameterized, so it can be used for Scheduled Publishing or Archiving, depending on the target folder parameter. It delegates to the WorkflowHelper's move() method. * from the Live folder. Called from Quartz. Parameters are set in code. The scheduled publish job finds the nodes for which the above action needs to be invoked. There are two instances of this job in the configuration, one for scheduled publish and one for scheduled archive. The query to run and the target folder to move to are set appropriately for each instance. * applies the named action using ActionService on each such node. The following code snippet represents the Spring configuration for the scheduler portion. Notice how much simpler this is compared to the configuration in the Scheduled Action Wiki Page. As before, the titles and descriptions are set up in the properties file. Notice that unlike the Workflow Actions, here there is only a single action that does two different things. This is because the action is not fired by a content rule, so the Job code can create the action, configure it based on which one (publish or archive) it is, and fires the configured action. The External Publish Actions correspond to a Drupal module I wrote that sends out an XMLRPC request to an external Java publisher on publish and unpublish events. The XMLRPC request parameter is a Map of node properties. One of the things it does in the Java publisher is write out the node as a JSON flat file. The thinking was that since reads outnumber writes by multiple orders of magnitude, it is cheaper to publish out to flat files and use that to render the page, rather than have to query the CMS on every read. XMLRPC was chosen because it is language-neutral and because Drupal supported XMLRPC writing (and reading). send-external-publish Public/Published/Live No INBOUND Invoked every time a Node moves into the Live folder. send-external-unpublish Public/Published/Live No OUTBOUND Invoked every time a Node moves out of the Live folder. Like the Workflow group of Actions, the actions are set up on the Live space via content rules, and are parameterless because they need to trigger without user intervention. So all they do is to delegate to the ExtPubHelper class with the appropriate parameters. * Send Publish XMLRPC request to external publisher. * Condition: type == my:PublishableDoc and subtypes. * Send Unpiblish XMLRPC request to external publisher. This is where the real work of converting the NodeRef to a Map of properties and sending it off to the external publisher happens. I do a bit of post-processing on the node properties to replace the key with the friendly prefix here. Alfresco already has the Redstone XMLRPC Library in its classpath, so I used that here. The code for the helper class is shown below. * will be thrown if the request failed. The Spring configuration is similar to the Workflow action configuration, so no surprises here. And the title and descriptions set in mycompany-actions.properties file. So there you have it. Its been a long post, thanks for staying with me this far, hopefully it has been useful. Despite the length, though, my overall impression is that setting up the workflow has been easier to do in Alfresco than it was in Drupal. I think one reason for this seeming paradox is that there is a fundamental design difference between Alfresco and Drupal. Using the Drupal point-and-click interface to produce customizations that approximate what you want is very easy, but customizing at the code level is much harder. On the other hand, Alfresco's web interface is not quite that intuitive, and much of the customizations that Drupal-ites take for granted is available only through XML (Alfresco and Spring) configuration, but the Alfresco Java API is much more mature, complete and easier to extend. Another powerful concept in Alfresco that makes things really simple is the concept of spaces. In my case, figuring out the current state transition is easy because you can figure out the source state from the current location of the node. This leads to code that is much simpler to write (and read) than Drupal code to do the same thing. Its almost like an extra dimension has been handed to the programmer to play with. So with Alfresco, if you are willing to write some Java code, the world (at least my limited Alfresco world) is your oyster. Of course, this opinion is probably predicated on the fact that I am better at Java than at PHP. Also, since I am by no means an Alfresco expert, I am not sure if what I have in here represent best practices or not - if you notice something that isn't or something obviously wrong, will appreciate knowing.